[Ottawa – December 4, 2017] Canadians are never far removed from a horrific story of gun violence. Whether it is the reports of ever escalating carnage in the United States, or the milder but still deeply concerning incidents in Canada, this problem is seen as blight on modern society. While Canada has only about one-seventh of the deaths per capita from gun violence that the United States endures, it is around the top of the list for other advanced western societies. Interestingly, Canada explored a national long gun registry in the wake of the massacre of women at École Polytechnique. While this became a controversial political football for a range of reasons, the desire to minimise gun violence was never a point of much disagreement. As gun proponents threaten a pro gun rally at the monument of this disaster, we thought it would be useful to revisit Canadian attitudes to this issue. There are all sorts of proposals for restricting access and flow of guns in Canada. We cut to a much simpler solution which finds very broad resonance with huge majority of Canadians (69 per cent versus 27 per cent). The question asks whether we should have a strict ban on guns in urban areas. Although support is much higher among Liberal and Bloc supporters, the clear majority of voters for all parties favour this idea. Support is extremely strong in Quebec and Ontario. More affluent and educated Canadians are in favour. As recent headlines have reminded of the special risks that women endure due to gun violence, we note overwhelming support in this portion of society. 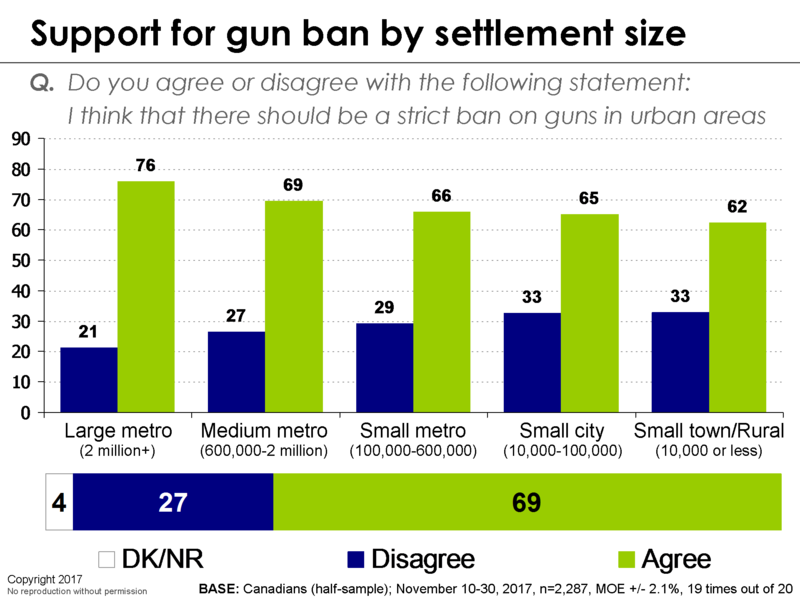 Turning to settlement size, we see that support for banning guns in urban areas rises progressively as we move from rural to ‘megapolitan’ Canada. 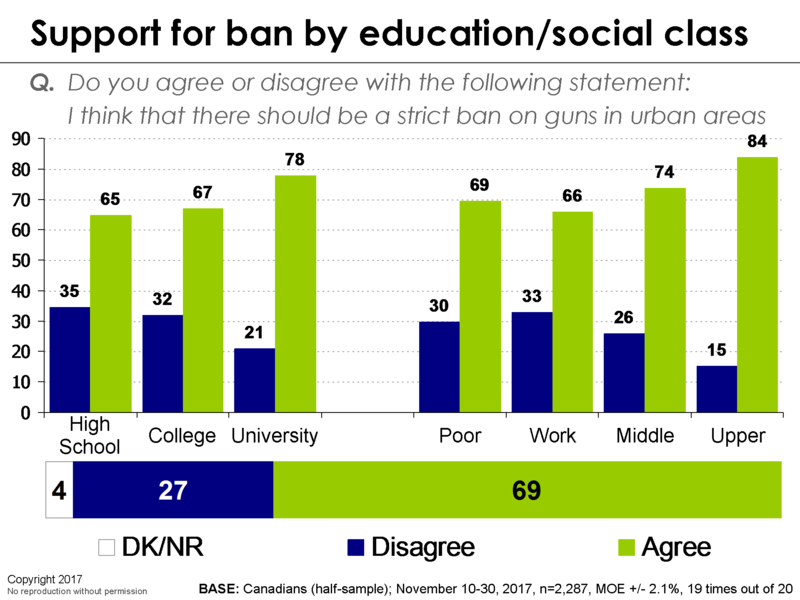 Even so, there is clear majority support for strict gun control across both rural and urban settlements. Many will claim this is a Pollyannaish and intractable proposal. We disagree and clearly the public are drawn to the elegant simplicity of this solution. Rural Canadians (and rural caucuses) note real concerns with gun control. No problem; these areas will remain unaffected. Hunters will object but checking guns out from a secure depository should not be an undue hardship. So, the question isn’t really whether the public support it but rather could it actually be done (and would the world look any different if we did). While speculative we can offer the following evidence that this could be done and that it would have a positive impact in reducing deaths from guns. In 1996, Australia implemented a very strict set of controls on guns following a large massacre. There have been no large massacres since and Australia’s rate of deaths from guns is well under half of ours. The UK introduced strict restrictions on guns some time ago. The rates of death from gun violence are less than one-fifth of ours. The closest model to the urban ban we are proposing is Japan which allows no guns (or swords). They have almost no deaths from gun violence. Our relative smugness on gun issues is the fact that we look pretty darn good compared to the nightmarish carnage seizing the United States. Ignoring our southern neighbours, we don’t look that good at all. The gun crisis in the United States is an incomprehensible stew of ideology and the profound influence of the NRA. These restrictions are largely absent from Canada. Moreover, Canadians are telling us in clear terms that they want to pivot in the opposite direction from where US policy is heading. The case is pretty clear. 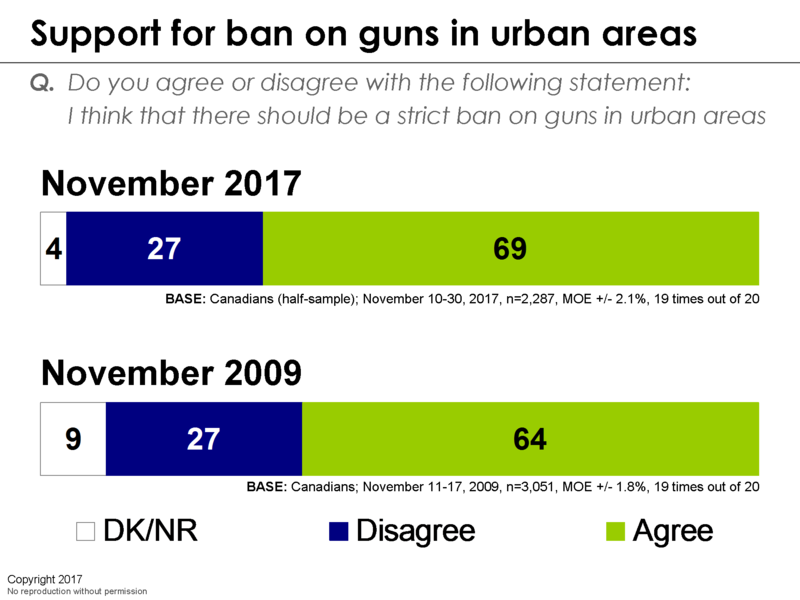 Canadians think it’s time to take guns out of our cities. Consider the inevitable saving of hundreds of lives every year as a major societal dividend. Please click here for a copy of the questionnaire. This a complete joke. So will Canadians still support this when the police go door to door searching for firearms? Or do you think the Feds should get them for free? As a gun owner I am laughing at the sheer stupidity of this poll and my fellow Canadians. A year from now I will still have my property and this poll will be gone and forgotten. This poll, and the writeup surrounding it can be safely placed into the ignore pile. There isn’t even a hint of neutrality in the writeup itself, which casts suspicion on the neutrality poll. However, it’s not surprising given other slanted writeups on this website. There’s the classic focus on gun deaths (versus overall deaths), and the alarm raised about women and gun violence. Nevermind that StatCan reports that homicides, especially gun homicides, disproportionally affect males. Although since we’re told that getting shot to death is worse than being stabbed or beaten to death, the boogeymen check out. The survey also seems to suggest that Canadians want more gun control. 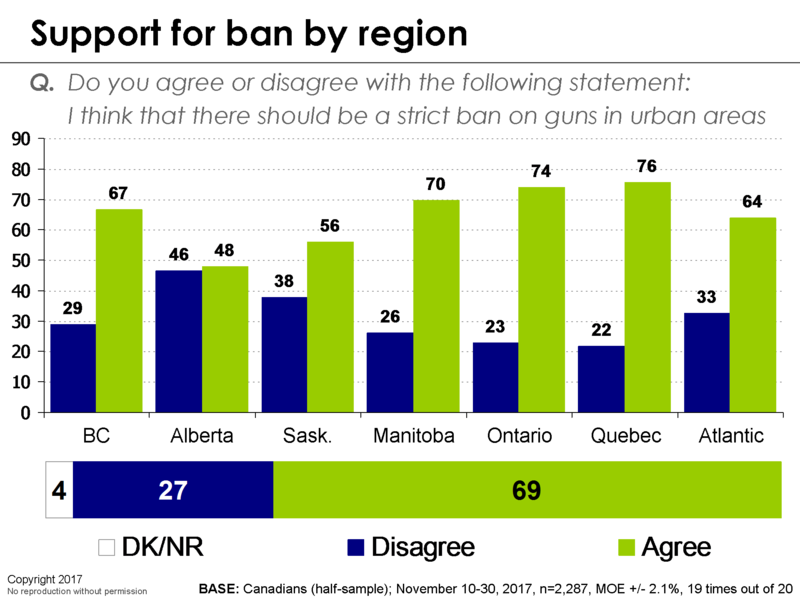 How many actually realize that an urban gun ban already exists in some form in Canada. Where is it legal to carry and shoot handguns? Certainly not in the middle of downtown, and not for decades. The writeup seems to infer a hell of a lot from a single vague question. This is a public-relations hit piece, nothing more. Unfortunately the majority polled were not equally polled the question if they are aware of the the already in place, very strict firearms licensing regime, regulations and laws. FACT: Not one gun ban would have prevented any of the following stats! The key missing is the increase in gang-related homicides. Police reported 141 gang-related homicides in 2016, 45 more than in 2015..that also correlates to a small increase in the gun murders, the majority of illegal firearms. So as far as going after the Legally Licensed gun owners, who are run through a background check every day (CPIC) is useless and hopefully the Public Safety Minister understands this. You can see the stats from 1995-2016 and considering the population increase not much has changed and gun murders are actually rare, we have more stabbings every year. 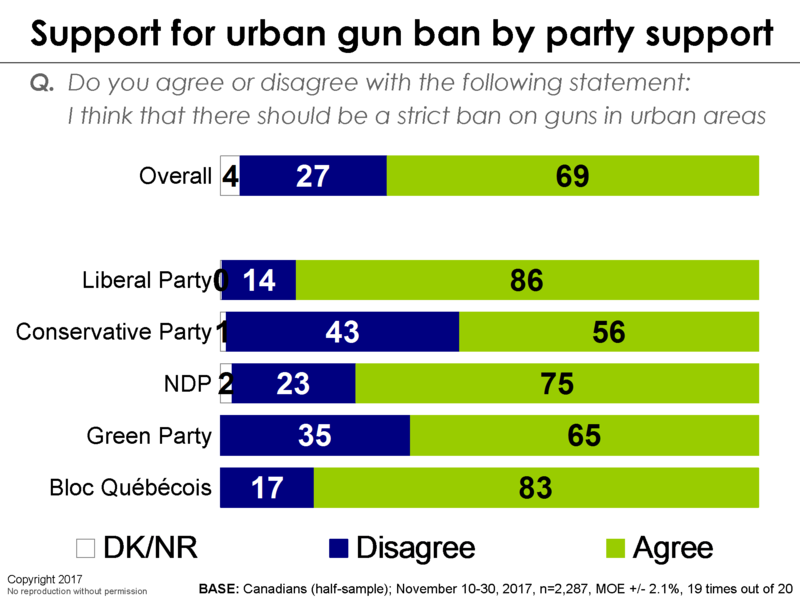 I think it clear that Canadians do not wish to have gun violence in our urban centres; however, your poll fails to point at the source of urban gun violence – gangs. With over 2 million licensed gun owners in Canada, there is likely a gun owner on your street or in your apartment block. We are not the problem and the sooner you recognise this and start going after the real culprits the better. Dear Ekos, There are problems with your poll and the claims you have made. Not only are they misleading, but it casts doubt on the impartiality and validity of your polls and statements. First you cite Australia as ‘proof’ – what you fail to mention is that the homicide rate went unchanged in Australia. Murderers didnt care, and found other ways to murder. No surprise. In other words, the gun legislation was completely ineffective at changing the murder rate. Second and most important. Countries that ban guns have the highest homicide rates. Countries without gun bans have the lowest homicide rates. (Source UN office on guns and crime). Besides, the fact that its deceptive, there are other problems with your poll that I don’t have the time to point out now. Suffice it to say, your work looks very shady, and biased to say the least. If interested, I would be happy to share information on Ekos history of bad polling. Re: Your simple idaea. Simple and stupid are cousins. But hey, if some Liberal politician sieges on this (it is nearly Grave-Dancing Day, after all) and it ever becomes law, I’m going to open up a storage facility in my rural home, and will happily store my fellow Canadians’s guns for free. And when crime rates don’t go down, (in fact…. wanna bet they go UP? ), we can all sit back and laugh, and remember the wasted $2 billion on the gun registry. what a laughable “solution” this again would not solve any issues with gun violence in canada..
the people and guns involved in gun violence are not adhering to any laws.. the current laws and structures in place provide safety and promote proper storage. a criminal will not follow laws and no changes to laws will stop criminals from committing crimes and inflicting harm on people..
Didn’t your polling predict a landslide victory for Hillary? No, EKOS did not conduct any polling in the last U.S. election. You can not lead an article with “most Canadians when you polled less than 100th of a percent of the population! This analogy makes the point that if selected properly, all you need to measure public opinion (or a cholesterol count) is a sample. A randomly selected sample of a population – meaning that every member of the population has an equal and known chance of being chosen to participate in the survey – can be used to estimate the views of the entire population. This is called probability sampling. When sampling is done properly, a random sample of just 2,287 Canadians can very effectively measure the views of an entire country. Obviously, with a larger sample, the accuracy of the poll – as measured by the margin of error – increases. With 2,287 people, the margin of error is plus or minus 2.1 percentage points, 19 times out of 20. But increasing the sample size yields diminishing returns to scale. For instance, we could have doubled the sample size to, say, 5,000 (which would have considerably increased the cost), but this would have only reduced the margin of error to 1.4 percentage points. Indeed, we could have invested a fortune to conduct a census of all Canadians, but this fortune would have reduced the margin of error from barely two per cent to near zero. Larger samples will still allow for better analysis of subgroups (region, age group, gender, etc. ), but there is otherwise very little advantage to sampling more than 1,000 people. What was the script said to each person called? What was the lead in to the question? Any other questions asked? What does “strict ban” mean? Does it mean no hunting in a public park or no open carry? The question is setting up for a specific response. Lots of bias in this question unfortunately. Also you ask if agree or disagree but report as yes or no. Do you [agree or disagree/disagree or agree] with the following statement: I think that there should be a strict ban on guns in urban areas. Press 1 for [Agree/Disagree] or 2 for [Disagree/Agree]. Respondents may also skip any question by pressing ‘0’. This is explained at the beginning of the survey, although respondents are not explicitly reminded each time. There was no lead into the question. The question was part of a larger survey, but it was asked near the beginning, preceded by just our standard questions on national/federal direction and vote intention. In retrospect, it is confusing that we reported the response categories as yes/no. This has been changed to agree/disagree in response to your comment. So basically you asked a simple yes/no question with no background information and therefore you are suggesting policy ideas based on that alone….wow….and in what other area would this be considered acceptable? You hate guns, we get it. But clearly you felt the need to toss out a worthless poll like this so you can join the annual Dec 6. grave dance. That really is just pathetic. A question that has the answer within the question itself which in itself isn’t actually a question. Once you attach I, Me or We it now has ownership of opinion. If it was worded as” I don’t feel there should be a strict ban on………” you would have different numbers. It’s an old experiment in psychology where you subconsciously tell the person their opinion while making them feel like they chose the answer. Many will agree because the preconception of the wording will sway towards the easy or agreeable answer. People like to be agreeable unless they have ODD or actually think about what’s being asked. This type of questioning is even avoided by stats Canada to get unbiased data. Thank you EKOS for doing the survey and for providing the additional information on your sampling. It’s hard to dispute that most Canadians want more restrictions on hand guns. Surely there’s a win/win solution out there that respects the rights of law abiding citizens while at the same time gets the guns out of the hands of gangs. It’s not the legal gun owners supplying the gangs. The guns come across the border from the United States. Australia is an ISLAND!! They don’t share the longest unguarded border on the planet with the largest number of guns per capita in the world. Legal gun owners are NOT criminals. We wouldn’t have a license if we were! Our firearms reside in safes with trigger locks in place AS WELL as the safe itself. Did you even know that? Likely not. How many of the “agree” respondants were agreeing with the strict bans already in place (ie., no carrying, no discharge, etc.)? This absolutely cannot be taken to mean “Canadians want stricter firearms regulations than presently exist,” and if Ekos wants to maintain the slightest appearance of integrity, they should explicitly state this. 1. Australia has not had a decrease in gun violence since the ban and even the go to has admitted it was an actual failure but a feelgood success. Mass shootings are so rare in general in their country. They are a blip (apologies for the callous way of putting it but statistics are statistics) . Estimates on the number of guns that fall into the banned category in Australia vary from 3 million up to 10 million still out there and yet arguing that post ban was a success is disengenious. 2.UK gun violence has not gone down either and in actuality home invasions are up and especially when people are home since they know the populace is likely unarmed. The UK still has guns and actually has a blossoming 3 gun competitions. They also don’t have enough magazine limits like Canada does but you know facts.. Ultimately everyone wants simple solutions but they don’t work with complex scenarios. Thanks for the thoughtful comments and I agree that this is a complex problem and that the poll only probes a limited area. I haven’t checked the claim on UK but the refereed study linked above seems to suggest that gun control did have measurable effects. Obviously, it is very difficult to draw sound causal inferences from uncontrolled pre and post data. Our poll item shows that the public are drawn to a simple solution. Whether that is naïve is something the experts and evidence can determine but I acknowledge the solutions are more complex. Isn’t there already a ban on crime ? Most Canadians? That’s a crock of you know what. I hope you don’t make a living on tax dollars. Nobody I know has been polled. This is a bs poll. Remember when the polls said the NDP where going to win the election in BC 4.5 years ago? That’s how reliable polls are. Was it ekos that did the poll that said the BC NDP were sure winners in the election 4.5 years ago? Dear bright, well educated, sophisticated urban people at EKOS, please answer; in how many places and how many times, in human history, have “strict weapon bans” been enacted? How about “strict gun bans”? What were the motivations for the bans? What were the results? Do the research and you will find you are not the first for coming up with the idea of “strict bans”. History is replete with such bans and you will find that the people behind such bans have always been tyrants, naive fools laying the groundwork for the rise of tyrants, or devious politicians exploiting the gullibility of voters with worthless but feel good policies. Google “A gang that couldn’t shoot straight- The Globe and Mail”. Pure Anti Firearm agenda and propaganda nonsense ! This kind of advocacy (I mean you really can’t call it research) is pretty absurd. Not only are you depending on the phone sample methodology which may or may not be accurate, or may be regionally dependent (EKOS may be pleased with their performance in some jurisdictions but the entire “BC” heading is articles describing abject failure), the question is totally ambiguous. What does a “strict gun ban in urban areas” mean? A ban on use? A ban on possession? A ban on crime? An automatic add-on to sentencing for crimes involving guns? A confiscation program? A simple idea? It’s actually extremely complicated. 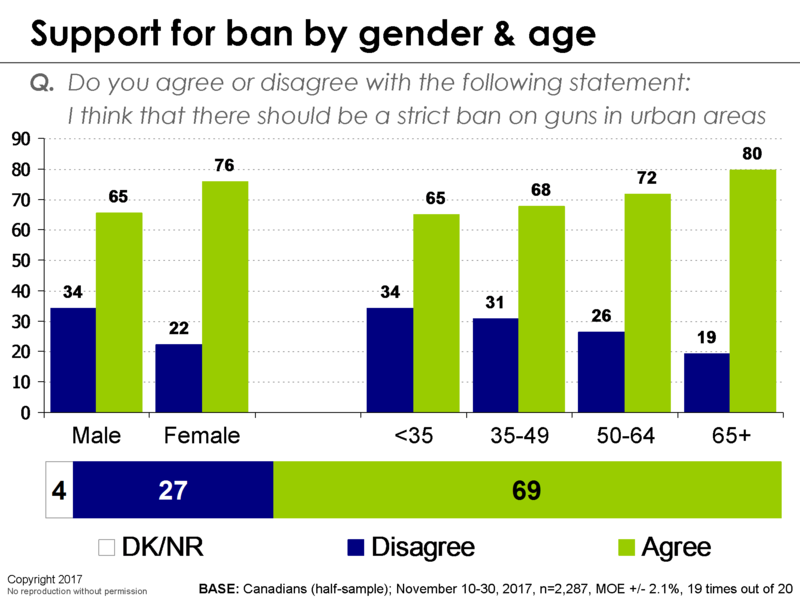 Here’s a REAL simple idea: if you actually want to know how Canadians feel about a topic as broad and nuanced as private firearms ownership, do some real research. A member of the public shouldn’t have to explain this to a polling company. Unless, of course, you don’t want to accurately gauge and describe public opinion, and you do want to pursue a political agenda and use your polling company to support your own biases. News flash – we don’t have a gun problem in Canada amongst law abiding gun owners PERIOD. To use shootings that happened 11 and 30 years ago as examples of why we need tougher gun laws just highlights the fact that our gun laws are working perfectly. We are not the USA!! Assuming we go ahead with an all out ban in urban areas,and we were forced to keep our firearms at a repository. Lets say I or a group of people have a desire to murder,either a single person or lets say I want to murder large groups of people,like a terrorist attack. Using household products,one can make bombs and poison with little effort. Same goes with using large vehicles and cars. The bigger question is,how do you ‘ban’ the murder? Its easy to conclude that even with the removal of every firearm in Canada,people will just find another way to murder. So, Ekos has a position on the subject and did “research” to support their position. Guess whose credibility is now zero? No point in even considering Ekos’s research as such, but that’s not really a new development. I was not polled, but I am very interested in this particular question, and I would answer “I do NOT support a strict gun ban in urban areas”. I am concerned that most urban Canadians believe that Canada has the same lack of control as in the USA. Canadians need to be better informed as to what our laws and restrictions already are, and whether or not they are being enforced in the courts. I do not think that there is any law or restriction that will prevent a criminal from acquiring and using a firearm. I disagree with a ban. We already have strict gun laws that criminals drive over the lawn and around the parking gate with in order to possess illegal firearms. A strict ban would punish only those who would voluntarily follow it…the law abiding firearms user. You should have asked Canadians if they would support a ban on using firearms for murder or other serious crimes. People would overwhelmingly vote “yes”. Then all you have to do is lobby the gov’t. After the ban on using guns for murder comes into place there will be no more murder by firearms! As a law abiding, tax paying Canadian citizen that has taken and passed the required gun licensing courses and undertaken all Canadian laws to handle, purchase, possess, transport and discharge firearms legally in Canada I am personally insulted by the questionable practices used in this poll in order to provide “data” for a self serving news release. Without providing the truthful information and background required to poll someone on a topic you are basically receiving an opinion on that topic which is uneducated and definitively unreliable and inaccurate. Proper polling requires the responsibility to insure that those being polled can form an opinion based on knowledge or experience in regards to the topic. Your tainted facts regarding Australia, UK, etc. crime and weapons offences are typical misinformation used by anti-gun lobbyists to draw misinformed responses and do not provide truthful background, information or enough knowledge to form an informed opinion. Has EKOS had staff undertake the required gun licensing program to provide the knowledge or ability to formulate questions for the poll that are truthful and reflective of an understanding of Canadian law? How does EKOS validate that they have the knowledge or experience beyond relying on other data that may be faulty or misinterpreted to professionally support these poll results. To suggest that Canadians gun laws as they currently are legislated in our country allows anything similar to the U.S. in not a misstatement it is a lie. Our systems are drastically different, those in Canada that choose to use firearms to commit crimes are criminals and do not get their gun licenses or abide by the laws in place to insure the safety of those in our society. Your company has obviously formed an uneducated and biased opinion that has transferred into and tainted the entire premise of this poll and renders it completely unreliable or trustworthy for any percentage. How about finding out next time if those you poll are able to respond properly to the topic and then ask them the questions. As of 8:50 pst 6000 people have responded with a 79% response of NO. The question, and analysis, presuppose that the participant is using a particular definition of “strict ban on guns in urban areas”. How do you know that the respondents meant ‘a strict ban on the ownership, possession, and and/or use of firearms by residents, visitors, and businesses within urban areas’? How do you know that the respondents were not envisioning a different definition? Was that even what was meant by ‘strict ban on guns in urban areas’? Have I interpreted it too broadly, or narrowly? If I ask about a strict ban of alcohol on city sidewalks, then that could be referring to consumption of alcohol, or openly carrying identifiable alcoholic beverages. Would someone also remember that a strict ban could also include the bottle in their grocery bag or backpack? Posing a simplified question means you probably don’t know how the respondent interpreted your question. It’s a simple idea all right… One would have to be very simple indeed to think such a law is not only enforceable but would have any effect on gun crime within cities. Canada already has a draconian gun control system in place; start by enforcing those laws. The wording of the questions is highly suspect and not only that you are in that line of questioning assuming that the people polled have a full comprehension of the way it’s tricky worded. I would call this slush it’s been made to form an uneducated opinion. I have been asking a lot of people about the gun debate issue. And when given the facts they vote 90% in favor of all people having the right to have a firearm, Unless you have a known history of violence with a weapon be it a knife or otherwise. This poll is complete drivel and it shows. I will be starting up a public radio show in the new year ad would very much like to get you on a call in or one of your people at EKOS to do a live call spot with open mikes and open to all callers. Just a few hours maybe 2 could suffice. I’ll be in contact with your media relations department in the new year. How the hell do you do the survey online? If you would make it clear and easy many would actually do it. I wanted to do it online but the pdf does not allow you to check off anything. I do not own a printer. Sorry, you can’t ‘opt in’ to our surveys. The key to producing scientifically representative results is to make sure that everyone in Canada has an equal chance of participating (or at least being invited to participate). Phone numbers are called at random and we’ll do up to three call-backs (depending on our deadlines) before giving up and trying someone else. If we were to provide an open link to the survey where anyone who happened to see the survey could participate (and forward the link to like-minded friends), we’d skew the results. From the looks of your survey it is already skewed. How about letting us know, how many liberals, conservatives, ndp took part in the survey. The geographical location of those polled, i.e. Toronto vs Thunder Bay, Montreal vs the Gaspe Peninsula, Halifax vs Sydney Mines etc. If most of your calls were to the larger centers, then yes you would get the answers you want. From looking at your polling data it leads me to believe that you are either a Liberal or NDP supporter and probably use questions, population which will support these policies. I like that you have replied to many of the comments and enjoyed your joke about blood samples. I do question this poll; not the results but the question itself. It could be interpreted as banning the use of guns in urban centres rather than ownership. I live next to a major urban centre and do own firearms. If you are asking that ownership should be banned I would obviously disagree, if you are asking if the use of my firearms in the city/town should be banned I would agree very strongly. I think you were asking the former but I can not help but wonder if some thought they were answering the latter. I generally like your poling however, this one isn’t one of your best. Hi Ekos. Keep up the good work. The comments section is just as informative (and entertaining) as the article itself. Wow! I just read through every one of those responses. There was ONE, and only ONE that agreed with the premise of the article above. Trudeau is already on shaky ground for the upcoming election. If he pushes draconian legislation like this through he will get clobbered in next year. I have a hard time believing these results. You did something wrong, and it’s clear you’re on for advocacy. The differences between age cohorts is surprising. Your quip about ‘blood samples’ is stunningly inept. Blood drawn from my hands will be pretty much the same as blood drawn from almost anywhere else. Not remotely appropriate as a metaphor for cross-sectional study. Getting a little tangential, but cross-sectional studies have been demonstrated to have serious problems with bias as opposed to matched pair studies.